We often underestimate the importance of a focal point in a space. I like to say it is similar to the flow of a conversation. When you enter a room something needs to “speak” to you first. It should be the boldest, the loudest and set the tone for all that follows. If you don’t have this piece, what occurs is a visual “shouting match” between everything else vying for your attention. What do I look at first- the plant, the table, the chair, the pattern of the carpet? It all competes unless you have one unifying piece that ties it all together. It’s the “alpha dog” of the room. The “inspiration piece”. It’s a “go bold or go home” moment. I have never found that multiple small art pieces will do the job the way one big piece does. 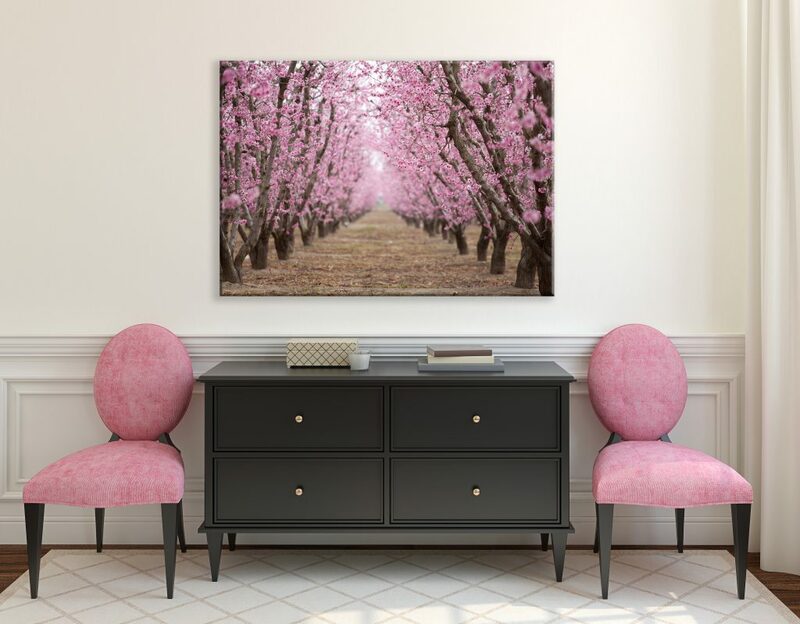 Investing in one big bold piece of art ties together the myriad of “stories” that are occurring visually in a space, connecting the color palette, subtle textures, patterns and lines, fills the empty spaces with it’s presence, and creates the energy level for the room. Wow! Did you know you could get all that from one design choice? 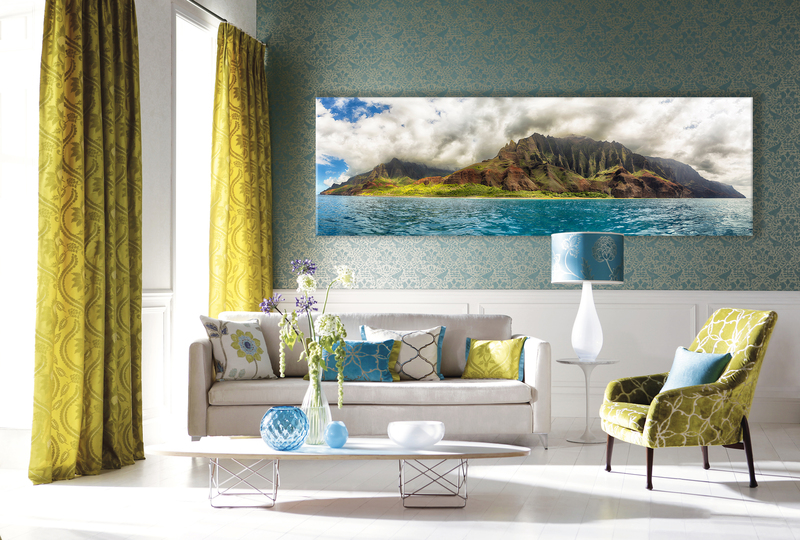 Our consultants at Latitudes Fine Art are here to help you connect the dots and find the perfect art for your space. Contact us today and find your focal point. 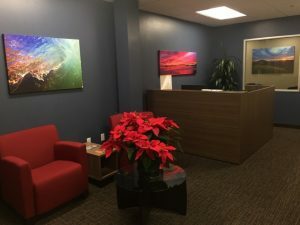 “Blazing Sky” is used as a focal point to tie together the horizontal lines in the front desk of this commercial space, the bold red chairs and rich dusty-blue paint. 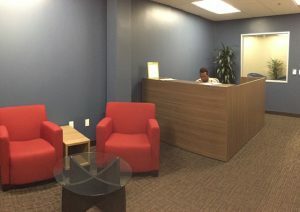 The colors are continued with “Liquid Crystal” in a more fluid style, creating an inviting and relaxing waiting room. The 40”x60” of “Two Trees Sunburst” peeks out through the glass window, letting the guest know there is more to discover. When finally reaching “Two Trees Sunburst” it leads to more drama and interest around each corner. 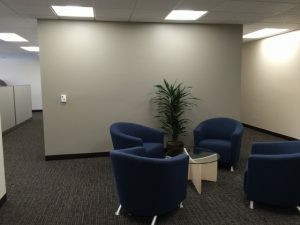 The art fills what would be a maze of sterile office walls, giving a presence to the empty spaces, and a way to navigate unfamiliar territory. 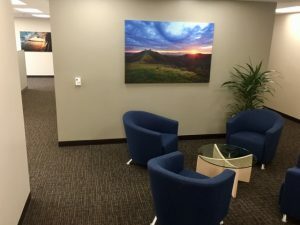 For those that work here, the landscapes from Latitudes Fine Art, provides virtual windows, keeping employees energized and centered. This dining room is filled by the soaring “Pelicans in Flight” for a private collector of Latitudes Artwork. He is called to the ocean and seeks pieces that fill the walls with water, movement and marine life. 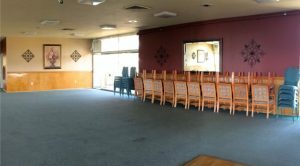 This commercial multi-purpose space needed artwork to represent our community and fill the massive amount of empty space. 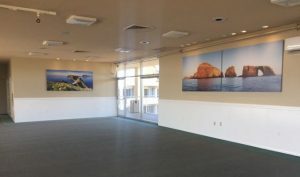 “Inspiration Point” and “Anacapa Sunrise” provide a soothing backdrop for any activity. 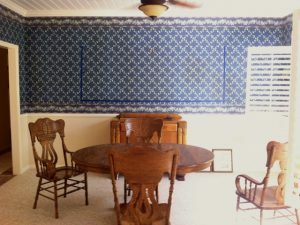 The paint color changes were suggested to enhance the art and the energy of the room. 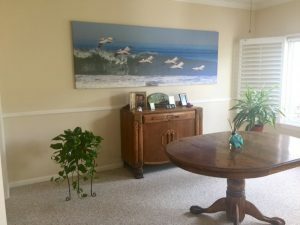 Art can truly be the key that ties an entire room together! Find out how we can help you find yours.